A new policy banning disposable items on the Weeki Wachee River is hoping to eliminate the amount of trash that gets into the river and on its banks. 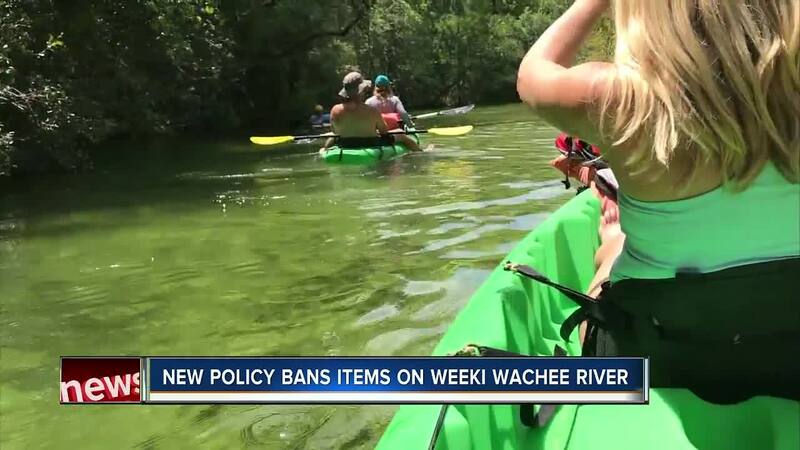 WEEKI WACHEE, Fla. — A new policy banning disposable items on the Weeki Wachee River is hoping to eliminate the amount of trash that gets into the river and on its banks. "No one wants to go into a pristine nature area and see trash," said kayaker Jan Leitschuh. That’s why Leitschuh, who is visiting from North Carolina, says she’s fine with Weeki Wachee Springs State Park’s new policy. "This is an environment worth protecting. I did bring a plastic water bottle but I also had my non-disposal so I just poured my water into here," said Leitschuh. The park’s new policy banning disposable items like water bottles, cans and plastic bags went into effect on January 1, 2019. It happened after volunteer groups picked up thousands of pounds of trash on the river. "We were collecting a lot of garbage so this is really going to help reduce that," said Ann Spivey Assistant Manager for Guest Services, the kayak vendor at Weeki Wachee Springs State Park. Kayaker Eileen Carr is all for the new policy especially after she and her sister spent one kayak trip picking up trash. "Instead of focusing in on the trip I was like Trish you're killing me, can we enjoy the river? But it was a great thing for the environment," said Carr. The state park hopes that only allowing reusable items on the water will help wildlife and kayakers enjoy the river for future generations. "You’re coming here to enjoy nature. You don’t want to see somebody else’s wastefulness," said Carr.